Cut is the result of centuries of research, trial and error. A stone is cut to show off its colour and create lustre by the play of light on its facets and eliminating its defects. Diamonds are cut by the diamond-cutter and other stones by the lapidary, both highly-qualified craftsmen. No one knows when exactly diamonds were first cut. 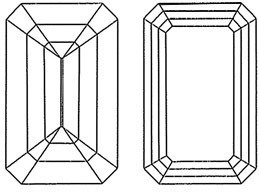 Originally, diamonds were worn rough (uncut) in their natural octahedral or dodecahedral form. 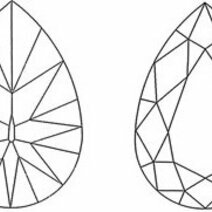 Although confederations of lapidaries are known to have existed in twelfth-century France, diamond-cutting only became commonplace in major European cities such as Antwerp, Bruges and Paris in the Renaissance. 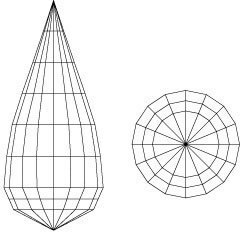 In the early seventeenth century Mazarin encouraged French diamond-cutters to adopt the rose cut, a style developed circa 1520. 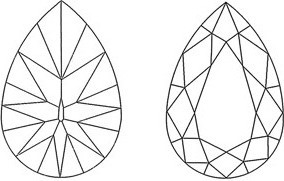 The stone is cut in a dome shape with a flat base and a variable number of facets. While some famous diamonds - the Great Mogul and the Orlov - are rose-cut, its lack of sparkle means it is rarely used today. 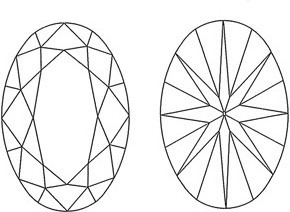 Early incarnations of the modern round cut appeared throughout the nineteenth century, such as the “double brilliant” with 34 facets and the “jubilee” with 88 facets. 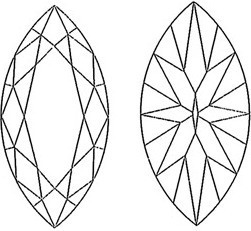 The "modern" brilliant cut was perfected by an Antwerp diamond-cutter, Marcel Tolkowsky, in 1919, after years researching physics and optical phenomena. The modern brilliant cut reveals the full extent of the diamond's sparkle, brilliance and fire. and the culet (an optional facet at the tip of the pavilion).